The Ellsworths of Long Parkmead had the regard of their neighbors in every respect. "Shades of Milk and Honey is an intimate portrait of Jane Ellsworth, a woman ahead of her time in a world where the manipulation of glamour is considered an essential skill for a lady of quality. But despite the prevalence of magic in everyday life, other aspects of Dorchester’s society are not that different: Jane and her sister Melody’s lives still revolve around vying for the attentions of eligible men. Jane resists this fate, and rightly so: while her skill with glamour is remarkable, it is her sister who is fair of face, and therefore wins the lion’s share of the attention. At the ripe old age of twenty-eight, Jane has resigned herself to being invisible forever. But when her family’s honor is threatened, she finds that she must push her skills to the limit in order to set things right--and, in the process, accidentally wanders into a love story of her own. This debut novel from an award-winning talent scratches a literary itch you never knew you had. Like wandering onto a secret picnic attended by Pride and Prejudice and Jonathan Strange & Mr Norrell, Shades of Milk and Honey is precisely the sort of tale we would expect from Jane Austen…if only she had been a fantasy writer." 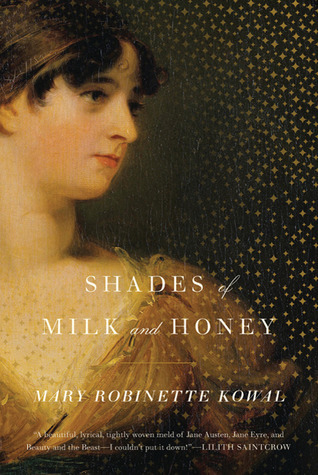 Shades of Milk and Honey really did feel like Jane Austen; in fact, it was almost too unoriginal. So many elements of the book are borrowed not just from Regency society, but from Austen's novels. As in Pride and Prejudice, there is an entail, and a silly mother. Mr. Vincent, Lady FitzCameron's new glamourist, highly resembles Mr. Darcy; he's proud, inscrutable, and seems indifferent to everything but his art. Jane herself is accomplished as a glamourist, and she can't really make anything of him. As in Emma, there is a strawberry picking party. There are all the elements of Austen's novels; proud, silent men, gay officers (in the old sense of the word), entails, and young ladies trying to find rich husbands. Miss Dunkirk was also very like Miss Darcy in more ways than one. She has a secret relating to love, and she's painfully shy until Jane draws her out. There was only the addition of lovely magic. I will say that the magic wasn't quite explained enough to my taste, but as one of the blurbs says, I found myself struggling to imagine a Regency England without magic after I read the book. And as Mr. Vincent suggests, perhaps it doesn't do too good to look deeper into the craft of the glamour. The first part of the book was very Austen-esque; mellow, and not very dramatic. The second half, however, read more like what I would imagine a Radcliffe novel, with lots of action. I liked that, though the change was a bit abrupt. The first section was dull, and the second section made the book more interesting, and added the mystery element to Shades of Milk and Honey that I was expecting, having read the summary of the most recent book in the series. The first big events happen really not until after 120 pages or so, but after that the book picked up. If the early sections didn't have enough action, then perhaps the later ones had too much. Everything moved really, really, quickly at the end. It was quite sensational, though still entertaining. What I was confused about was the title; it was very strange, and I couldn't see how it fit the book. It was pretty weird, and the climax, resolution, and ending felt way too rushed. One thing that was problematic while I was reading was that I already knew who Jane was going to end up with, having read the summary of the third book, Without Summer which is recently out from Tor. Still, I enjoyed reading about both Mr. Dunkirk and Mr. Vincent, even if I knew who Jane would marry. Really, if you have read Pride and Prejudice, you can guess. I really loved all of the characters, especially Jane, who although plain, is adept at glamour, and very intelligent in other respects. She's very similar to Elizabeth, except for the fact that she is not particularly pretty in the traditional sense. That, I think, was the main problem with the book. Jane was so similar to Elizabeth, Mrs. Ellsworth so like Mrs. Bennet, Mr. Ellsworth so like Mrs. Bennet, and Vincent so like Darcy. There were some characters like Jane's sister Melody who were different, but a lot of them were so, so similar to P&P characters that it got kind of annoying. I appreciate that the book is really trying to imitate Austen plus magic, but a slightly different set-up would have been good. Still, I think the book really succeeded in imitating Austen's writing and capturing the spirit; I was interested in the characters despite their strong resemblance to others. I wanted to know what would happen to them. The writing was good, and so was the story; the book wasn't overwritten and did have its own character unique from Austen, although I think it could have shone through more. I did like how the glamour took energy, the same as running up a hill or any physical exertion. Overall, Shades of Milk and Honey was a bit predictable and uneventful at first, but I ended up liking it for its magic and for its wit. Austen fans who also like fantasy and aren't absolute purists will definitely enjoy the book; others, I'm not so sure. Still, I would recommend it, and I've heard that the series gets better. I'm definitely planning to try the second book, Glamour in Glass, although I have a feeling that one gets tired of this kind of book pretty quickly.